Aurora film 8181 can be laminated to 48 gauge polyester and micro slit into thread. 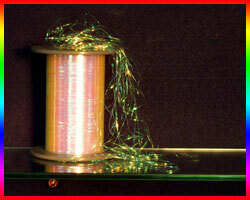 These iridescent shimmering threads can be woven or spun with other materials to produce a twisted yarn. Aurora 8181 is available in Red-Red, Red-Green, Blue-Green, and Blue-Violet colors. 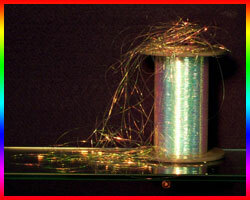 Aurora ShimmerSilk is an oriented version of 8181, allowing thread to be micro slit without laminations. This yields a very soft material than can be used in textiles designed to be in direct skin contact.